For most internet users, SPAM is an inevitable consequence of having an online presence. Spam-related problems also affect WordPress users, but for different reasons. 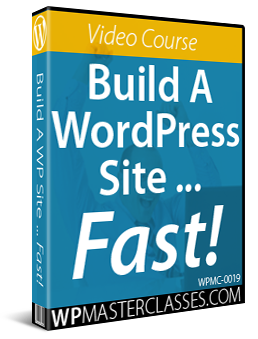 The first issue, is that WordPress is the world’s fastest growing CMS (Content Management System) platform, used to power millions of websites and blogs worldwide, and so it is an obvious target for hackers, spammers and bot programmers. Unlike regular spam, which is unsolicited email aimed at getting you to buy stuff from the spammer, ‘comment spam’ is usually aimed at getting your visitors to buy stuff from spammers. It is a ‘parasitic’ relationship that benefits the parasite while harming the host. Finding ways to combat and prevent comment spam on your WordPress site, therefore, is something that you will need to address when building a presence online. 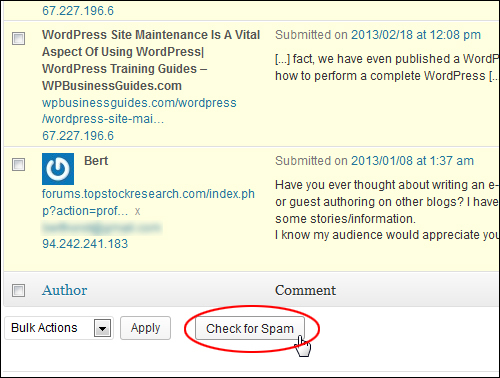 Every WordPress site is bound to attract comments from spammers. 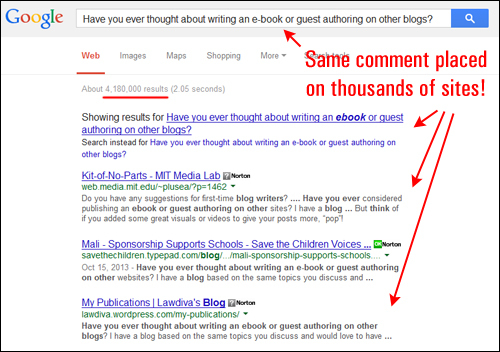 Many spammers use automated software to place comments on your site hoping to get a free backlink (i.e. a link pointing from your site back to their site). In fact, this is how many questionable SEO service providers make money … clients pay them to get their website links on other sites, not realizing that many of these links are achieved through spamming practices. Also, savvy spammers use software that searches for sites that allow unregistered users to place comments on sites automatically, which means that site owners are ultimately fighting a losing battle against machines. 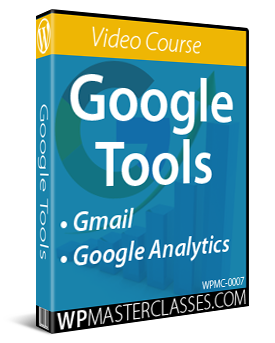 The sender’s email address – if the email comes from a free service or a throwaway email service, or it has a nonsense name, then it’s most likely comment spam. 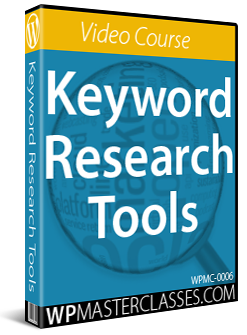 The sender’s domain – if the comment contains a link to a website address, check if the domain name seems genuine and if so, is it related to your field? The sender’s IP – when in doubt, check the IP address of the commenter using a free service like WhatIsMyIPAddress.com. It will tell you which country the comment originated from. This can be useful, especially if the comment came from a location known as a place where hackers and online scammers operate from. Moderating comments and manually checking for spam can take up a lot of your valuable time and resources, especially when dealing with sophisticated spammers. Not only that but if your site becomes a magnet for spam comments, it can also affect your rankings in the search engines. Lower rankings mean fewer visitors. 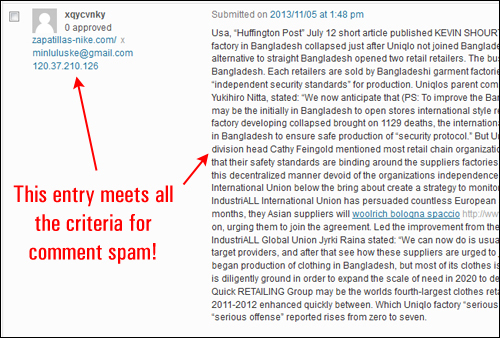 It’s important, therefore, to have a system in place for managing comment spam on your site. 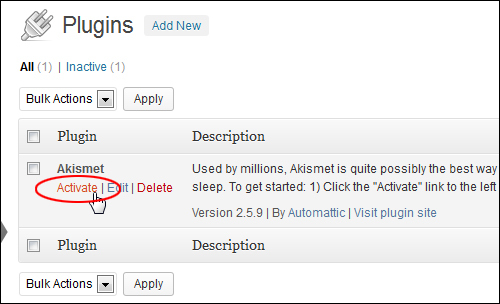 In this tutorial, you will learn how to combat and prevent SPAM using a WordPress plugin called Akismet. 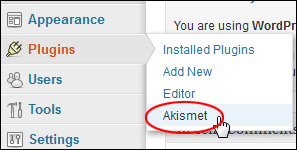 Akismet checks your comments against the Akismet web service to see if these look like spam or not and lets you review any spam it catches under your site’s Comments admin screen. 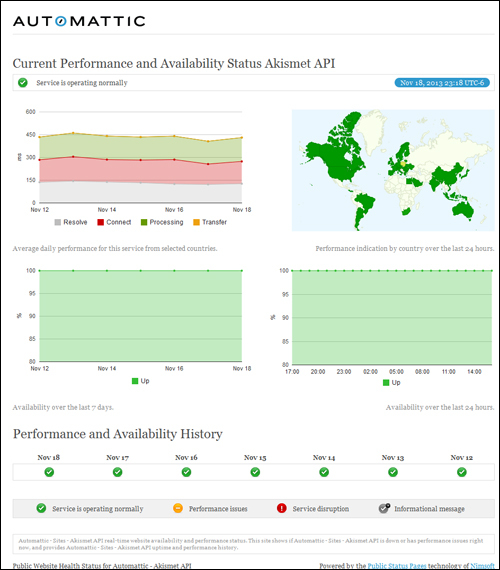 The Akismet servers monitor millions of blogs and forums, watching the methods and tricks used by spammers in real time. 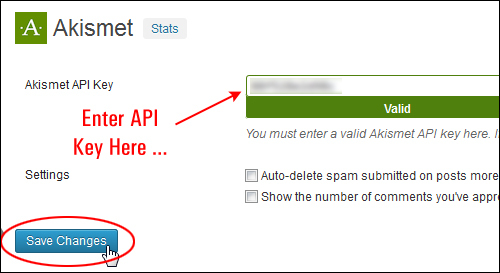 When spambots, comment factories, buffer sites and social engineering tricks are identified, Akismet uses this knowledge to try and prevent automated or human spammers from trying to place a spam comment on your site. 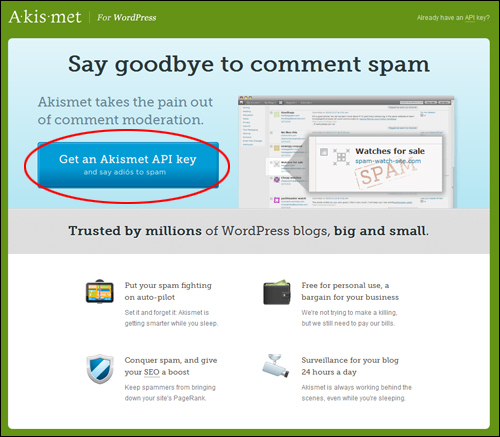 Akismet was developed by Automattic, a company founded by the creator of WordPress itself, Matt Mullenweg, and has proven to be very effective in fighting SPAM. 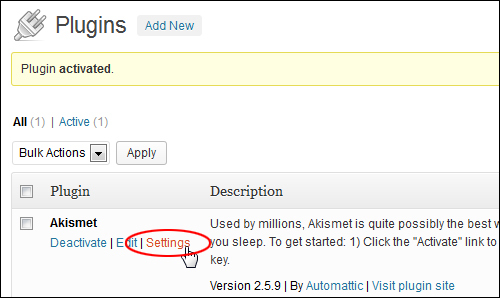 Millions of WordPress users have Akismet installed on their sites. 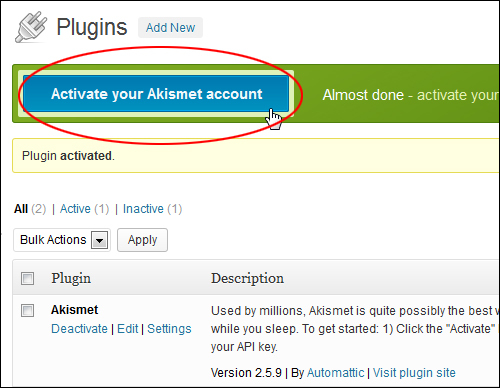 Akismet requires an API key (API = Application Programming Interface) in order to work on your WordPress installation. Note: If you are blogging for profit or creating commercial WordPress sites and using Akismet, you might end up finding yourself in a licensing predicament. As such, if your site is for a business or if it promotes a product or service, it is highly recommended that you choose your license from one of the paid Akismet options. 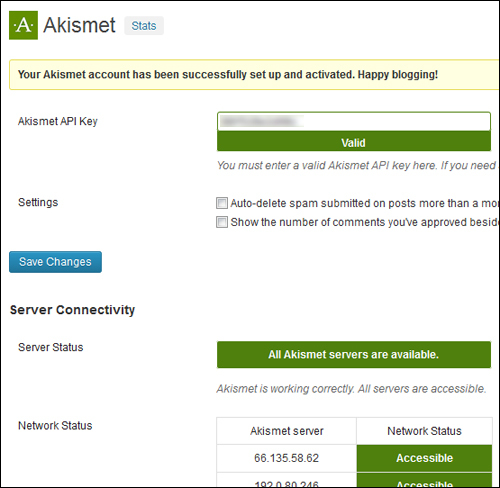 As stated earlier, Akismet comes installed with every new WordPress installation. Auto-delete spam submitted on posts more than a month old. Show the number of comments you’ve approved beside each comment author. 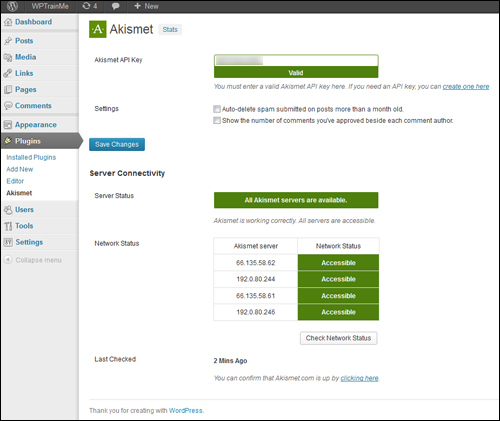 Akismet is hosted on a network of servers and operates over multiple server locations, so it’s constantly checking and rechecking your comments to see if they really are comments or just spam. 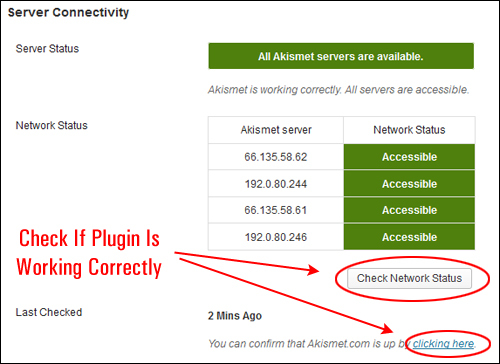 Note: If your web host is unable to reach Akismet’s servers, the plugin will automatically retry when your connection is back up. You can easily see which comments were caught or cleared by Akismet and which were spammed or unspammed by a moderator from your Comments screen. 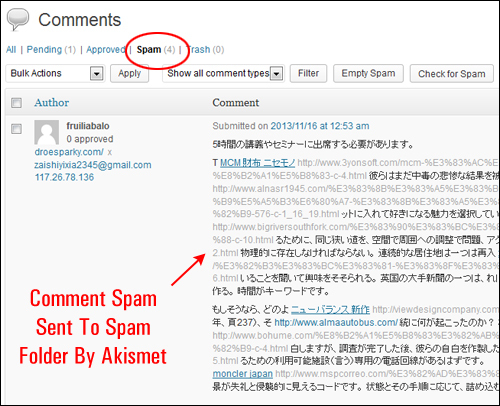 Akismet provides a comment status history feature that lets you easily see which comments were caught or cleared, and which were spammed or unspammed by a moderator. This lets you keep track of comments that you report as spam, and also lets you see how Akismet checks and re-checks comments on your site. 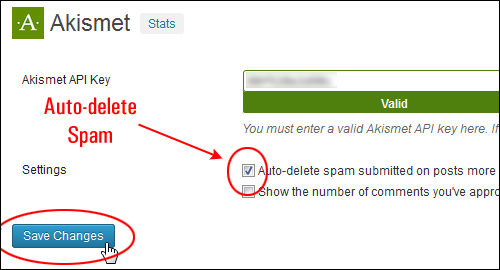 In fact, each time a new comment, trackback, or pingback is added to your site it’s submitted to the Akismet web service which runs hundreds of tests on the comment and then returns a thumbs up or thumbs down, saving you the time of sorting through and deleting spammy comments from your site. 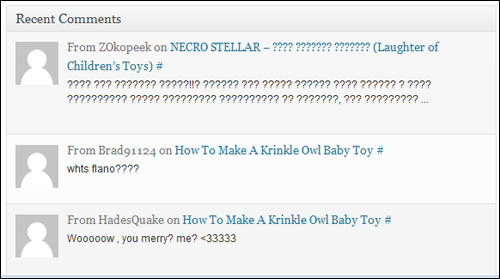 As you can see, Akismet is very effective at helping to manage comment spam on your site. 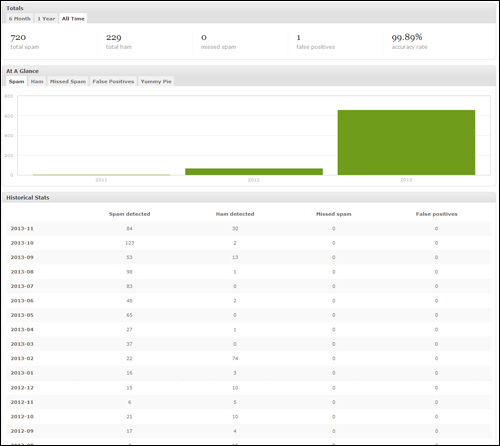 Once the plugin is set up, it goes to work in the background, monitoring all incoming comments, then analyzing, filtering and isolating anything it determines to be spam. 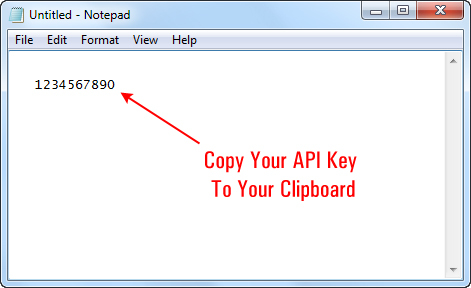 Antispam Bee is an easy-to-use and highly effective anti-spam plugin. 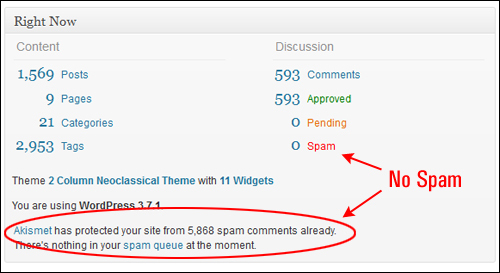 It protects your site or blog from spam by replacing the comment field. Quick & Dirty: activate, set settings, done! Spam Free WordPress is a comment spam blocking plugin that, according to developer Todd Lahman, will not only block 100% of the automated spam on your site with zero false positives, but also claims to outperform Akismet in its 100% accuracy with zero false positives for automated spam (manual spam is blocked with an IP address blocklist). 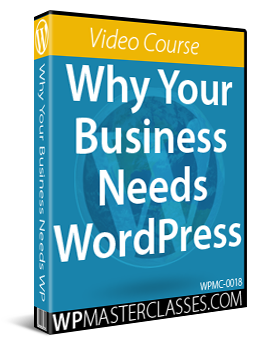 The Spam Free WordPress plugin was born out of the necessity of helping a heavily trafficked site fight spam that multiple plugins could not stop, but instead increased the load on the server fighting the spam. 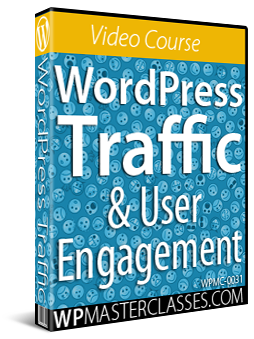 Since then, Spam Free WordPress has been tested successfully under real world heavy traffic and heavy comment spam, conditions. 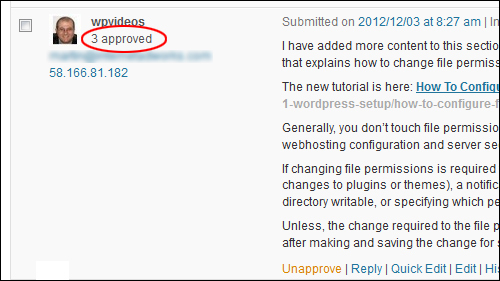 Spam Free WordPress recommends that once the plugin is installed, no other comment spam plugins are needed and should be disabled, as these may cause undesirable false positives. 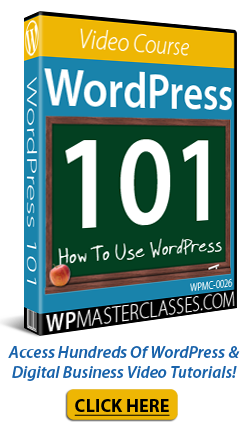 Spam Free WordPress also has a mission to help WordPress become the world’s first and only comment spam free blogging platform. 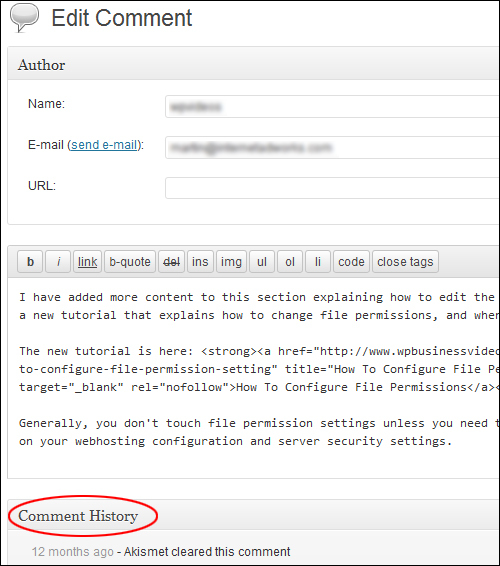 In addition to using plugins to help combat spam, you can learn how to configure your WordPress discussion settings and manage your WordPress comments. Congratulations! 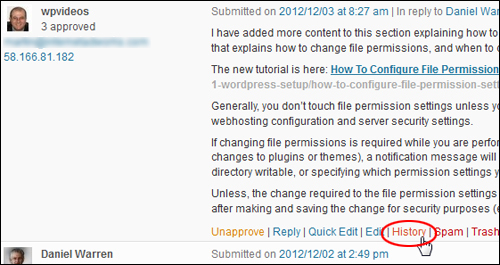 Now you know how to combat, prevent and protect your WordPress site from comment spam.